With permanent failover, you can finalize failover to a VM replica. As a result of permanent failover, the VM replica on the target host ceases to exist as a replica and takes on the role of the original VM. Open the Home view, in the inventory pane select Replicas. In the working area, select the necessary replica and click Permanent Failover on the ribbon. Open the Home view, in the inventory pane select Replicas. In the working area, right-click the necessary replica and select Permanent Failover. In the displayed window, click Yes to confirm the operation. To protect the VM replica from corruption after performing a permanent failover, Veeam Backup & Replication removes the VM replica from the Replicas list. 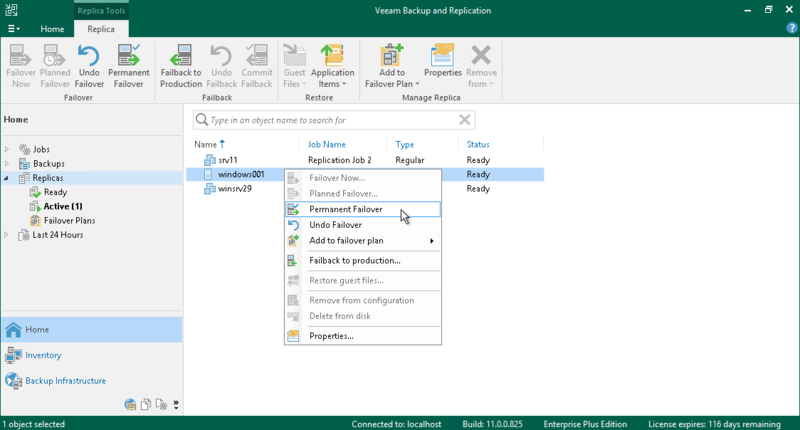 Additionally, Veeam Backup & Replication reconfigures the replication job and adds the original VM to the list of exclusions. When the replication job that processes the original VM starts, the VM will be skipped from processing, and no data will be written to the working VM replica.